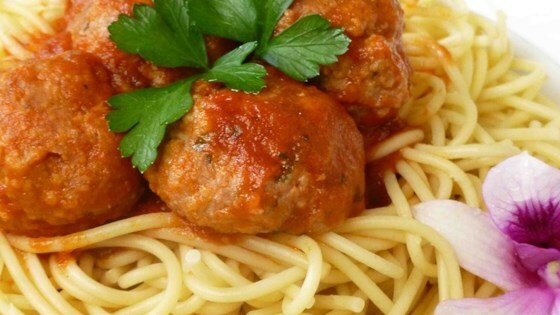 "This authentic spaghetti and meatballs recipe is made with fresh oregano and parsley. Because the meatballs are cooked in the sauce, they are tender and savory." In a bowl, mix the ground round, bread crumbs, remaining oregano, remaining garlic, parsley, eggs, and cheese. Season with salt and pepper. Roll into 1 inch balls, and drop into the sauce. Cook 40 minutes in the sauce, or until internal temperature of meatballs reaches a minimum of 160 degrees F (72 degrees C). The meatballs were really good but the sauce was way to sweet. Use alot less sugar and maybe one less can of the tomato paste. I made it as is will use the meatball recipe again. Excellent recipe!! I only added 1/4 c of sugar, and that was still a bit sweet. I also added mushrooms and a few tablespoons of red wine. This gave it great flavor!